Search Engine Optimization (SEO) is all about knowing where to focus your efforts for the biggest payback. The best strategies are constantly changing as the Search Engine algorithms change. This article describes the current (November 2013) most influential areas for marketing activity and should remain relevant for some time, bar any major changes in Search Engine strategy. There are four main categories that most influence the ranking of websites on search engines. 2/3rds of SEO influence is off-site through the social networks and backlinks from other websites. Search Engines are continuously trying to identify quality websites and their best guess at the moment relies on the activity a website stirs up in the social networks. These networks should be your primary focus for advertising and promotion, aside a quality website of course. There are 4 main social network platforms that dominate SEO rankings. Facebook is still the social networking platform of choice but the Google plus platform is becoming more important, if nothing else because it is Google. That said, Google Plus is very impressive once you look into it in detail. It has not grown up in public like Facebook and a lot has been added in a short time so it is still not properly understood by many people and is not as intuitive to use. However, if you have not yet started to grow Google circles then you are seriously missing out. Pinterest and Twitter are useful in certain market places but not in others though neither can be ignored. Pinterest is fairly versatile but Twitter is hampered by continuously changing rules and regulations aimed to control its users, rather than going with the flow, so innovative marketing strategies can be risky. The influence of backlinks has reduced in recent years and rightly so as it is has proven the easiest method to manipulate and distort good quality search results. Marketing activity here focuses on guest blog posts, writing articles, creating video channels, forum posts, website comments and building relationships with other websites in your community. I have heard ‘building backlinks’ described as grunt work but it is really your Public Relations. Backlinks are important and you should be generating these by default. Participating in forums, issuing press releases, writing articles for blogs, journals and article sites are all part of your PR activity. If an article, post or page is well written then it should contain everything that you need to rank well. In practice this is often not the case as it is quality content that search engines seem to get most wrong. The focus has been to weed out fake and misleading websites and this has worked very well. However, identifying true quality has mostly eluded the major search engines and the result has been a dearth of mediocre repetitive content. For general knowledge and education Wikipedia is still the best place to go, but its scope is limited. Like a public library, Wikipedia is not the best place to research anything topical or ground breaking. Innovation and information with a premium attached, falls to the online marketers. Knowing what you need to include on a web page is essential and fortunately there are a lot of free and paid for tools out there to help you to analayze and fix any omissions or errors. This subject will be dealt with in detail in a later post. The following table breaks down these four areas into its most important parts. 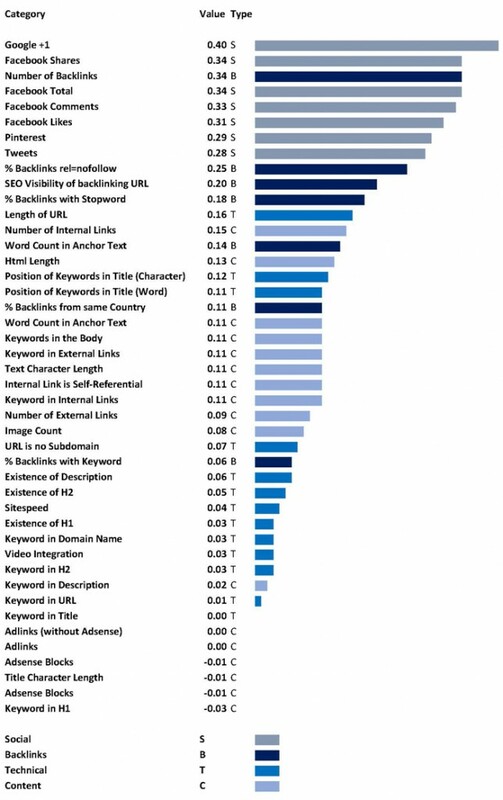 From the top down this should be the basis of your SEO strategy. Not surprisingly Google moved into the Social Networking sphere a short while ago and has been quietly building an impressive platform. If you haven’t already created a Google Plus presence then the following 4 or 5 steps are essential. NOT optional. If you are using WordPress as your website platform (which you should be) then install the plugins Google Analytics for WordPress and SEO for WordPress on your website. The number of times that a Google Plus profile shows up in a circle is an indicator of how engaged a profile is with the Google Plus network. Quantity is not better than quality but profiles with thousands of followers will draw more visitors than those with only a handful of followers. Google Plus users will only see posts after they have added you to one of their circles. The more times that your profile shows up in circles, the greater the chance of your website posts being noticed. If your profile is in a large number of circles on Google Plus will give your profile a higher PageRank with Google. Google Plus profiles that have achieved high PageRank through continuous engagement pass SEO benefits to all of their managed pages. Interact with people who are already on Google Plus. Enough activity will help grow your circle count organically. Create shared circles that list people who have a common interest with your profile and promote the shared circle to your peers. We all like to be part of a club that directly involves us in a joint project or interest. If this is done well then the circle grows as people share it and draw in new members. Think Facebook or Linkedin Groups. Mention Google Plus in your posts and articles. This seems to work very well as people can see the benefit as Google, like any organisation, likes to be talked about. Post regularly to your Google pages. You can link your WordPress feed directly to a Google page with HootSuite which is free if you have a couple of feeds going out to 5 or fewer social networks. Use Google Plus Ripples to learn who has been influential in promoting your post. Studies into consumer behaviour shows that certain individuals are key networkers who love to share. Get to know these people and thank them for their participation, they are important members of the community. Any Facebook post can be shared and any image tagged. Both of these activities will post to your timeline. This is the Search Engine’s highest rated action on Facebook. It is seen as an truly authentic vote by the search engines as it is very hard to manipulate.. Targeted Facebook advertising is about the best way generate new Facebook shares. You need a post that people would be proud to share for all the usual psychological reasons. No-one will recommend anything that will put them in a bad light, especially in front of their friends. The priority is to learn how to write and submit ads properly. Facebook advertising should only cost a few cents for a click through to your Facebook page. I would highly recommend Armand Morin’s training on this subject. Click here for an educational video (also a sales pitch but interesting content anyway). Facebook shares are good for SEO but Facebook is not a direct selling platform. Posts linked to sales pages do not do well as people are not primarily on Facebook to buy. [Aside: You can now (since April 2013) place direct eBay listings on a Facebook page and effectively create a mini eBay search page. This is probably a move by Facebook to introduce the idea of sales pages in their mainstream website away from the Facebook MarketPlace]. Advertising effectiveness has to be tracked carefully as Facebook page shares (and likes) are still one step away from your website sales activity and may not contribute to any sales. Measuring the cost-benefit of a Facebook share is tricky; if anyone has tested and measured this in any way then please feel free to contribute in the comments section. Exactly like Shares these are harder to come by. The best way to improve comment scores is to actively reply to all messages and comments to get a conversation going on your Facebook page. This applies equally to your blog comments. The fastest way to lose people is to ignore them, so reply to everyone. Easier to get than Shares and easier to manipulate, so worth less in SEO terms. Similar to shares the best way to get Likes is through brute advertising. Never be tempted to buy Facebook Likes through some outsource service. This will hugely decrease the effectiveness of your advertising as ads will be served to people with no real interest in your product or service. You can opt to serve ads to people not connected to your pages but it is not as effective as targeting those people already engaged in your page. A recent study from Semiocast shows that Pinterest currently has more than 70 million users on the site and 30% were active in the month that users were polled. Pinterest now the third most popular social network in the United States according to Mashable. Back in February, comScore reported that Pinterest had 48.7 million users globally so there has been a large growth spurt this year. There are still only 500,000 business accounts mainly in the USA (no surprise) and China (surprise). Pinterest went nofollow in March 2012 so links from images no longer count towards SEO ‘link juice’. Look at the most popular Pinterest walls and they are almost works of art. The visual impact can be tremendous and is a great brand building tool. Active participation is key, like Google Plus or any Blog being part of the community is what works. For the first time you can see Pinterest Specialist showing up in job descriptions so the big brands appear to be employing dedicated people. Pinterest is all about images and there is no better place to source them than Dreamstime as it has a big resource of free high resolution images as well as some great deals for monthly bulk downloads that give you high resolution images for less than $0.20 each. Twitter users that retweet others, participate in tweeted discussions and engage with followers are vastly more successful than the Twitter users who only tweet their own links or randomly follow hundreds of users every day in the hope of gaining followbacks. One of the most interesting studies found that Google has threshold levels of tweet activity that count towards Page Ranking. The first threshold is 50 tweets and the second is around 5,000 tweets. So, getting to 50 tweets is essential but after that it takes a lot more work to improve the SEO effect. Note that tweets from different users count a lot more than the same user tweeting the same website link.